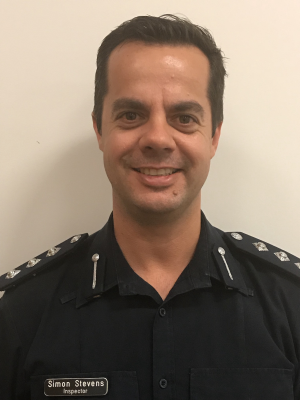 Inspector Simon Stevens is the Melbourne West Local Area Commander in Division 1, North West Metro Region. Simon has been an Inspector for the past 7 years, working across the western suburbs and in the City of Melbourne. In his role, Simon manages over 240 staff and a high number of demonstrations across the CBD with many major sporting and cultural events. Simon has the International Students Portfolio for Victoria Police managing and implementing safety engagement programs for students across a sector worth $7.1 billion. Simon is the manager of the MY City Taskforce, the police response to late night policing every weekend in the CBD and is Chair of the Melbourne Licensee’s Forum, Victoria’s largest forum with over 15% of the state’s licensed premises in his area. Simon has been a member of Victoria Police for 24 years working across a number of metro and country divisions including the State Crime Squads and Melbourne Highway Patrol. Simon was involved in creating the Melbourne CBD Safety Plan, Melbourne’s inaugural evacuation plan which won a National Safety award in 2012.